This is a classic hospital bed sore case. A woman falls in her Temple Hills, Maryland home and fractures her hip. She is transported to MedStar Southern Maryland Hospital. When she is admitted to MedStar, her skin is in good condition. She has no skin breakdowns or pressure ulcers (a synonym for bed sores) anywhere on her body. The woman remains at MedStar for more than six months. During that time she develops pressure ulcers which become infected. Therapy is unsuccessful in preventing the spread of the infection and the growth of the ulcers. The woman dies from sepsis approximately three months after she is discharged from MedStar. The woman's husband filed medical negligence, wrongful death, and loss of consortium lawsuits in Prince George's County, alleging that MedStar violated the standard of care by failing to provide appropriate medical and nursing care to the woman to prevent her injuries. As a result of MedStar's negligence the woman was forced to undergo painful surgeries, incur substantial expenses for her care, and suffer severe injuries that resulted in her death. Pressure ulcers result from prolonged, unrelieved pressure on a body part. Contributing factors and risk factors include lack of mobility like you would have in this case with a fractured hip, insufficient nutrition and hydration, and the facility's inability to keep the resident dry and clean. The standard of care for preventing and treating pressure sores begins with an accurate assessment of the patient's risks for skin breakdown. If the patient is found to be at risk for a skin breakdown, the facility has to implement a plan of care to address that risk. There is no survival action filed in this case even though this woman suffered for six months before she died. Why? There is no way to know, but it may be because the plaintiffs' lawyer is trying to avoid a Medicare or heath care lien. You will also notice that the lawsuit is filed against the hospital without naming the negligent doctors or nurses. This is one of those rare win-win opportunities for both the plaintiff and the defendant. The plaintiff gets the benefit of just pointing to the hospital, which makes it easier on the jury to find liability because they can blame a large, corporate hospital instead of individual doctors and nurses who might come off as very nice people. The hospital benefits because it can protect their doctor both from the stigma of a lawsuit and an increase in their malpractice rates. 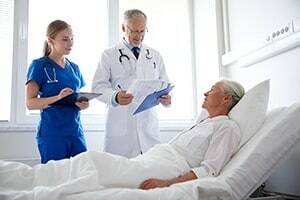 This tactic also makes it easier to settle the claim, as it takes out the risk that the doctor will push the insurance company not to settle because the doctor does not want to see his malpractice insurance rates go up. If you or a loved one has been harmed by a medical mistake by a doctor or hospital, we can help you. Our law firm has a history of getting large verdicts and settlements in medical malpractice cases for our clients. Call us today at 800-553-8082 or get a free online case review. There is no cost or obligation to learn about your options and the best path forward to receive compensation for what you have endured. What is Maryland malpractice claim worth? How much can I expect for my bed sore injury or wrongful death lawsuit in Maryland?